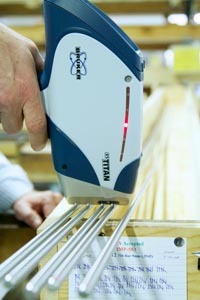 XRF Gun for Positive Material Identification (NDT PMI). Seconds per Test! 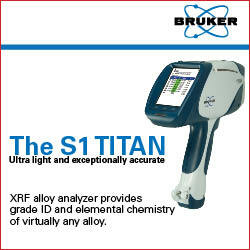 When knowing the alloy chemistry of a sample is crucial, but destroying or damaging the sample is not an option, Bruker handheld XRF nondestructive alloy testers offer the perfect balance of near laboratory-grade accuracy and fast, nondestructive analysis. Analyze any metal or alloy sample from stainless steel to high purity gold with one fast, nondestructive tool. Contact Bruker’s nondestructive alloy analysis team to learn how our alloy testers can eliminate materials mix-ups, providing complete alloy chemistry within a matter of seconds, and nondestructively identify almost any alloy grade. Bruker instruments are non-destructive testers because they work on the principle of X-ray fluorescence technology. The alloy testers contain an X-ray tube which causes a change in energy by emitting X-rays to excite electrons in atoms. The changes in energy caused by this interaction are unique to each kind of element. This unique energy is then detected by the alloy tester, thereby allowing the instrument to identify which elements are present in the sample. The sample is not altered in any way by this interaction, and is exactly the same after analysis as it was before analysis. Contact us today to find out more about Bruker’s nondestructive testing instruments for alloys and metals.